Bingo Zoo | New Online Bingo Site for 2017! You’ve probably been hearing the buzz about Bingo Zoo for some time and it looks like this brand new bingo site might be just about to launch. One of the new Cassava bingo sites for 2017, this Dragonfish powered site has a fun zoo theme with colourful animal characters. Bingo Zoo is asking their future players to help name the zoo animals and if your name is chosen, you could win a trip to your local zoo! The site wants everything to be perfect for its debut, so enter your top name for the monkey, panda, and giraffe and yours just might be chosen! We will keep you posted as to when Bingo Zoo has finally launched and you can meet all the zoo animals! We are still waiting for the details on the Bingo Zoo welcome bonus but if it is similar to other Dragonfish sites we can expect their typical offering. We would guess its somewhere like add £10 to play with £50 with some free spins thrown in to sweeten the deal. 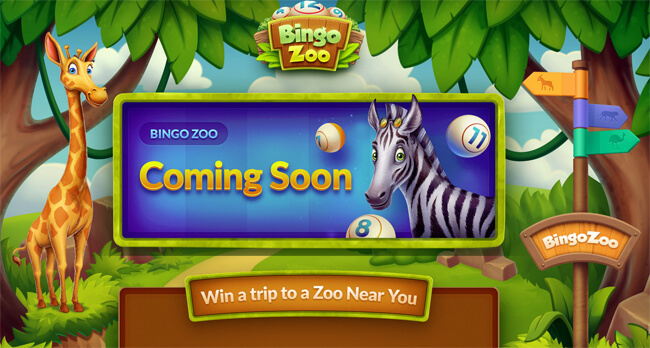 But to be sure, we’ll just have to wait for the Bingo Zoo site launch and see what’s in store! Bingo Zoo has given us a small sneak peak as to what we can expect when it opens its doors. So far there will be mega jackpots to win, and prize pools shared across the network. There is also talk of an excellent loyalty rewards program for the most loyal players. Their first promotion is in line with the Bingo Zoo theme and the sites underlying support for local zoos. In this contest, participants can enter a unique name for three of the cute animal characters on the site, a monkey, panda, and giraffe. Each name gives you one chance to win so enter three name ideas for three chances to win a trip to your local zoo! Another promo that will launch with the Bingo Zoo debut is a raffle to win an Adoption Programme worth up to £60. Once a player makes an initial deposit and collects their Welcome Bonus, they need to add just £10 more to enter this animal raffle. The 10 lucky winners can win the adoption programme for the animal of their choice! So far Bingo Zoo has announced that they will feature the popular 75 and 90 ball bingo games as well as various free bingo games. They will also offer hundreds of side games including online slots, scratch cards, table games, and live dealer options too. While we don’t know exactly which games will be available, we can guess that Bingo Zoo will have most if not all of the popular gaming titles that other Dragonfish sites have. We are still waiting for the site to launch and when it does there will also be an option for mobile play. You will be able to access all the animal fun from your smartphone and tablet for big bingo wins on the go! We will keep you posted about the Bingo Zoo launch as soon as we get the news!